Supplied new to Thomson and Taylor in the UK, this delightful Giulia Sprint, chassis number AR 353224, was converted to Right Hand Drive by Ruddspeed. Ruddspeed's dashboards were not known for their strength so about thirty years ago, the then owner commissioned a custom built unit, looking like a correct Alfa Romeo item, but much stronger and more robust than the original converted dash. It is in its original colour of Bluette and has been lovingly cared for but never fully restored. Its rebuilt engine, which has been converted for unleaded petrol, is an absolute gem and the brakes, steering and suspension, having been recently overhauled by DTR European Sportscars, are excellent - the car is lovely to drive. One owner kept the car from 1985 until 2014. It has had five owners in total. 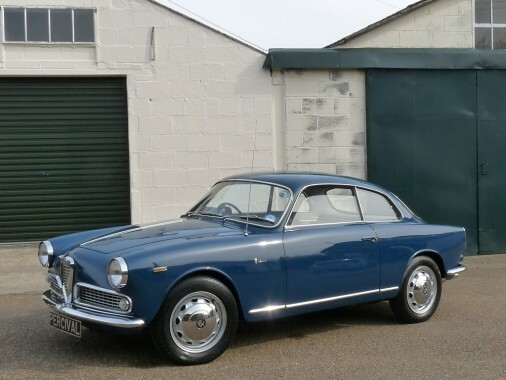 A lovely Giulia Sprint in very nice order with the benefit of being very rare in right hand drive form.